During part 4 I experimented with photographs and got into the notion of the associated memories of old, especially family photographs (see. Project ‘Squaring Up‘). My tutor felt these paintings as quite successful related to the sequence and showing step separation (similar to interim stage print proofs) and the possibility to work more with photographs. I am wondering about the motivation of other artists to paint over photographs. Therefore, I looked at Andrew Haire, Gerhard Richter, and one artist I discovered through Instagram. Also I looked into artist statements in order to understand motivation and approaches. Haire uses photography as his staring point for his paintings. He is interested in photography because “by today’s culture of endless photos, the editing of these images in apps, their influence on the composition and interpretation of a picture and how landscape fits within this context… Today .. natural imperfections can be built upon through use of editing software and filters. This is a very painterly notion we are all our own artists making creative decisions affecting, changing and enhancing an images original subject matter and narrative.” (A. Haire’s artist statement). He is using photography to paint over and to response to the image and on the other hand he gets further ‘compositional inspiration‘ from this overpainted photographs for his elaborated paintings. He works with acrylic paint skins, gel glazes, Perspex and image transfers. A very layering approach to painting. Haire’s interests lay in the areas of the sublime, contemporary landscape painting, photography and the creative process. Overpainted photograph: ‘ 3/36 Untitled 3‘, Acrylic on photograph, 15 x10cm, 2013. => The paintings, drawings and photographs investigate image deterioration and manipulation, and the properties and possibilities of acrylic paint. 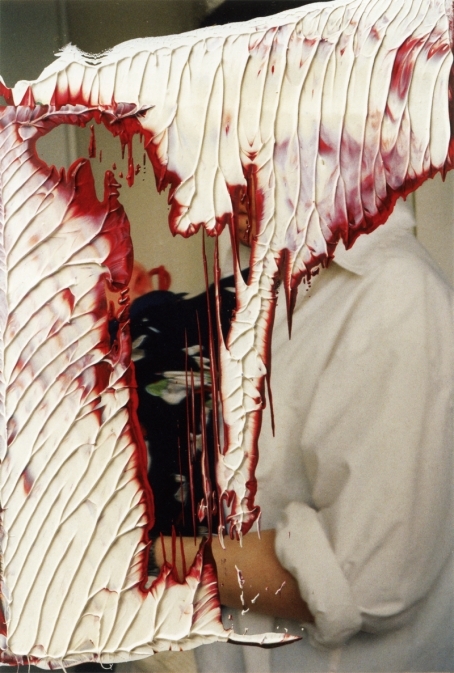 ‘Ubermalungen (Atlas Tafel 469)‘, 1988 Oil on colour photographs on card. 9 overpainted photographs, each measuring 10 cm x 15 cm. Richter is using commercially printed photographs in postcard format and smearing oil paint left over at the end of the day, pressing and scraping achieving various visual effect. I do understand that the photograph is considered here as an object, a different reality juxtaposed with the abstract smears of the paint reality. On Instagram I found another artist who is using drawing to add a new reality to the underlying photo images. In sum there are various approaches and motivations for overpainting photographs: Gerhard Richter used left over paints to overpaint postcard photos, Andrew Haire uses photographic images as the base for his response in paint and as inspiration for new paintings, and Diana Richey-Ward applies a poetic approach to create new dynamic realities of overdrawn photographs. With that research I embarked on my own painting approach and experimentation with photographs taken from location. Getting inspiration on the spot from my responses of the image chosen and using for painting. My overall intention with using photographs is to get them on another support for further elaborated painting. Trying to transfer photographs with acrylic transfer technique to my sketchbook pages. Found that inkjet prints on normal paper work better than on photo paper. The latter has a more robust and thicker paper, hard to peel of after glued on support. Normal paper easy to peel off. Glueing the prints with acrylic adhesive works very good. => The peeling off makes it as a process fascinating. One the one hand the disclosing of hidden, concealed images. On the other the debris, paper residues one produces. I decided therefor to glue those paper debris not the same page. Kind of evidence, memory. I let the image tell me what marks or paint to add – or not. => I find the concept and visual effect of peeling off fascinating. The process of disclosing what was formerly concealed is truly an aspect of the uncanny. Working with acrylic transfer of inkjet prints on photo paper. Nice and clear printed image. I continued to work with overpainting with acrylic paint to add more of the surrounding space, creating of unsettling sensations, adding oblique architectural lines, creating running down ink, gestural strokes. Overall fun studies. At times I felt kind of sucking into the visual space. The paint covers, conceals the underlying photograph, making it like peeking through a hole, a window, from outside to inside. Partly I emphasised this effect with darkening the edges. As the surface of the transferred photograph is acrylic adhesive, not the print ink, the surface became blurred and milky when applying water. It should come back clear, but I had to rub into fresh water several times (e.g. the bottom left image with the bird house). Gave first an unsettling feeling and than I thought about how difficult it i at times to get to the center, the secret of a person or something else. I could sense my gaze here – quite literally, stubborn and not going away. => I find those interesting, a fun way of working with ‘found images’, responding to those with layers of paint. As already mapped out in my plan and thinking process I feel quite fascinating by the architectural elements of doors and windows. On the on hand they are opening and letting in, on the other hand they are concealing, hiding. An object of transition between outside and inside, external and internal. To elaborate and emphasise this I overpainted the door image and surrounded it with dark paint. Making the ‘window’ of the colourful door even more dramatic, haunting. => I find these quite intriguing and as a subset also successful as visual. As suggested by someone on the OCA discuss forum I tried next to print on transparencies. Avoiding thus the acrylic transfer process and using my underpainting to glue my print. The transparency has a glossy backside and a matter printed side. I tried both ways (first one printed side glued into the paint, glossy side up; the second one vice versa) The image below doesn’t show the glossy surface. The issues with sticking transparencies onto paint is that it peels off after some time, something not happening when using acrylic transfers. At least if happens on flexible ground as my sketchbook pages. => Those under- and overpaintings of photograph (rather a collage) do provide a new dimension to the picture. I can see it as an indirect (making an underpanting considering that a photograph has to get onto it) and direct (overpainting of the photograph) response. At the end I decided to ‘repeat’ Gerhard Richter’s approach with applying thick oil paint with platette knives into the 15x10cm photo cards (inkjet prints). Was more of ‘doodle’ thing during break time for me. Nevertheless I embraced this process of chance and painted over the images, informed by the underlying image as well as by the side image. => The juxtaposition of two images and how they informed my overpainting was somehow quite intriguing and fascinating. I feel that especially through the links there is another narrative coming through – underlying photograph and overpaintings. I do perceive the last set of two images as a fence and a rose – quite poetic. A sense of beauty and sublime. Perhaps the 2nd set is the least successful as I do not perceived the two overpaintings as coherent enough. Perhaps I need to cut them apart. Whereas in the 3rd set through the variation of left and right a certain visual space is created. Overall a fun painting exercise and with a surprising visual result. Sure another way of showing a narrative – through appropriated photographs. There are two ways to get a photograph onto a support: via acrylic transfer or with glueing a printed photograph into an underpainting, with best to use transparencies to have more visual depth. It is a fun approach of working with ‘found images’. A very direct way of responding to images with layers of paint. A composite approach of media? I find the concept and visual effect of peeling-off the backside paper of a photograph fascinating. The process of disclosing what was formerly concealed is truly an aspect of the uncanny. The approach with direct print on transparencies and glueing with the underpainting is quite intriguing and does work as a subset and as a visual. However, keeping the transparencies stuck to the support and the paint is an issue. Im myself can see to use photographs to create or build a different reality, to build on the photographic intrinsic notion of memories, and to get inspiration of new paintings in context. My last series of overpainting done in context of G. Richter ended with for me surprising results. Quite different then the other studies. I do tend rather to my other approach of collage embedded in a painting with paint going over the edges, feel more gestural and expressive. Feeling myself less constrained in space.